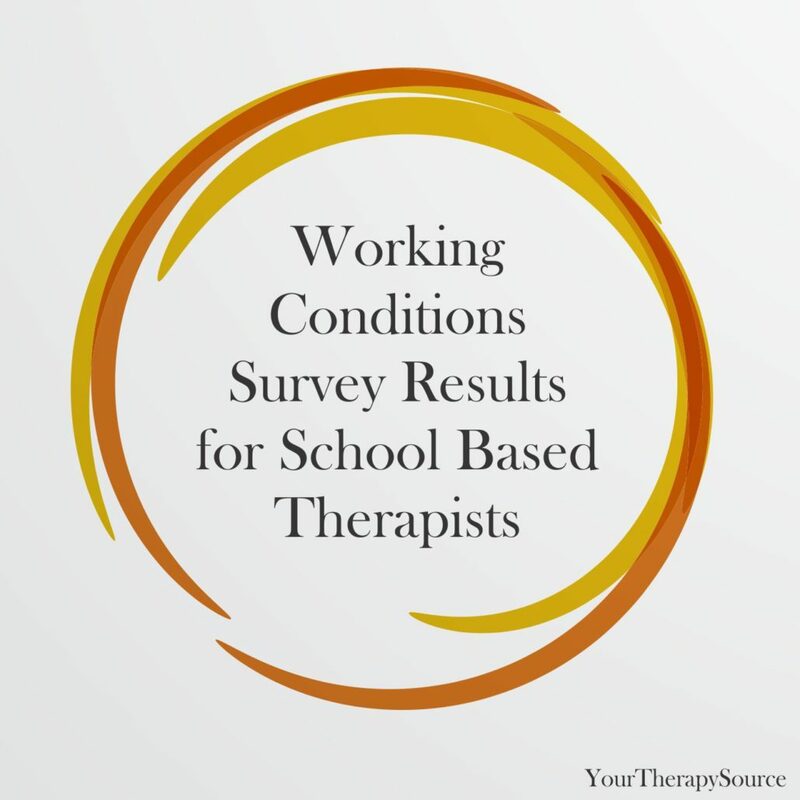 The working conditions survey results for school based therapists have been summarized. As you can see from the results, there were 431 responses to the questions about working conditions. Frankly, I was shocked that close to 79% of the school based therapists felt that a national organization should be formed to establish working condition standards ( caseload, sessions per day, ratio of direct treatment to consultation with teachers etc) to improve outcomes for students receiving OT, PT or speech. Whether that comes to fruition or not, it seems obvious that therapists need some help or guidance. You can view the results below. Following the results are some of the comments that were added to the survey. Perhaps these results will help motivate additional research on the topic helping to make positive change. Please take a moment to answer the current survey on handwriting and keyboarding. Do you think school based therapists should form a national organization to establish working condition standards ( caseload, sessions per day, ratio of direct treatment to consultation with teachers etc) to improve outcomes for students receiving OT, PT or speech? National standards would be nice. I live in a state that has very little school based representation, standards or guidance at the state level. There needs to be a caseload limit. And when the limit is reached the therapist can be expected to look at discharges and if no discharges can be made then additional services need to be contracted out! All states/ districts vary as do students. I think we need to belong to AOTA,APTA and ASHA and communicate with stakeholders. It would be difficult to prove that more time for therapists improves outcome of students as therapist expertise and goals and experience is as variable as the students we work with. I don’t feel there is a national approach as these things vary by state, county, and city. However, I think there is a standard that should and could be placed by AOTA. It likely already is, and I’m just ignorant of it at this point (just started working in schools). I didn’t know what to ask for, and I ended up in a mess with little time and poor accommodations to service students. I do not get the opportunity to do my full frequencies, and push-in is being promoted, but in many ways is not helpful to the actual OT-related items I’d love to do. I am the only OT servicing every student in three rural counties driving up to 75 minutes in one direction for one student. We are told it is the expectation as a salaried professional to complete your work at home. Practice patterns and work expectations vary too much across the US to try to legislate working conditions. I review IEPs from other states and they are very different from state. To make guidelines for workloads yes. We need to have some sort of standard in order to incorporate all the factors that go into service provision. We used to have a formula that took into account number of schools, number of miles between schools and then number of service hours with number of students. Without a format, school divisions will continue to push for whatever the staff will bear! I think to form established regulatory standards via a national/formal organization for school based therapist is an excellent and much needed idea! I have been a school based PT for 24 years. Over that time, my methods of intervention have ‘evolved’ to encompass inclusion, embedding skills within the natural setting, etc. Unfortunately, our administration still equates IEP minutes with ‘that is all the time you spend with that child’ so therefore you should be able to see this many in this amount of time. Conversations around workload versus caseload are evolving, but in these badly funded school settings with a number crunching administrator, it is a difficult conversation. We desperately need supporting standards, etc to help us provide what we know is needed in order to address the needs of our students and their classrooms. Thank you for starting the conversation with this survey! I have worked in many different school based settings, and I have found that each one is unique in it’s own way. The number if students that are appropriate depends on the types of students you have, and therefore cannot be assigned a random number to determine a caseload. That said, admin does need to understand the need for time for consult, research, observation etc and not look at the 1:1 contact with students only. We need guidelines on our case-load size when working in the schools. This could be provided at the state- or county-level rather than nationally. A national organization would be great, but each student receives such individualized service that it would be difficult to establish working conditions that were uniform across the nation. Some areas favor direct pull-out therapy some favor favor push-in therapy of more consultative nature. I feel like school based PT’s are such a small portion of the profession as a whole that we are often overlooked. It would be extremely helpful to have some national guidelines! I am currently overseeing a staff of 12 OT’s and PT’s in a school district so this would be helpful as an administrator as well. This is already encompassed in AOTA or APTA. Not to mention that a group can suggest all they want but it is a long way to laws and financial support. The Feds have yet to fully fund their initiatives for Special Education of the 70’s. I think there should be some sort of a cap on the amount of students on caseload for each occupational therapy practitioner. Dedicated space to see students is a big problem!! The wide variety of service provision across the country causes problems when children move and services change – it would be helpful if we could all be on the same page to determine when it comes to how, how much, where, when, etc for service delivery. A national organization would be very useful for research. Regarding the last question, guidelines rather than standards might be better. Each child and each classroom environment is unique and we must have the flexibility to adapt. There are currently no guidelines out there that indicate the workload vs caseload for all therapists. We are left to advocate for ourselves in a system that has been notorious for having small budgets. I am constantly performing work at home on my own time, spending money to buy supplies needed to provide services and constantly on the run! Every caseload, just like every student, is unique. The ratio of consult to direct treatment changes with caseloads and from year to year depending on need. Sessions per day can also change depending on the needs of students, special events, length of sessions, etc. Caseloads change depending on needs and could be larger with lots of consult or smaller with lots of direct service. Not sure if we need an actual national organization, but better support at the state level, backed by AOTA. A set of standards to refer to would be helpful because many therapists are working singly in school districts. Also as contract therapists rather than employees we often have very little say the hours that a district is willing to pay for and often little job security. I hesitated to answer the last question. I’m not sure that is the answer, but having standards to refer schools to would give more weight to my one opinion about the quality of services being offered. I find that I am often asked to observe, informally assess, or provide suggestions for students that are not on my caseload. I am happy to do this, but find it takes my time away from planning intervention sessions with my students. I wish there was time carved into my schedule to assist my building in general, in addition to time for my students. I want to be able to do both effectively. Each campus and organization too unique. Goal is to work together to provide services for kids. Although I think collaboration of ideas is always great, the way this question is worded sounds more like someone wants to mandate the situation. Every school district, available staff and caseload is unique and continuously in fluctuation as students move in and out, making set requirements impossible to maintain. Back in the 80’s some practitioners and I began the movement for more organization among school based practitioners. We were instrumental in getting guidelines for best practice written as well as professional development and fieldwork sites for training. I have been actively practicing as a school based OT for over 30 years, never have I witnessed a more greater need than ever for a a national organization to support us and would be willing to help! SLP have a caseload max in the schools. I see their caseloads going down. Caseload standards would be beneficial to our students and to our profession. I have been a school therapist for nearly 20 years and caseload/level of service has been a constant struggle. Nationwide recommendations or guidelines in this area would be extremely helpful. As a school based PT for 20+ years, delivery of services has evolved significantly. When we talk to our administrators about our needs, it would help to have standards to refer to as they still want to tie services to the amount of time on the IEP. I am required to pay teachers union dues and benefit very little from those other than salary negotiation. Having our specific practices and related issues supported would be more appropriate. I believe there should be guidelines from AOTA (APTA, ASHA, etc.) to set an appropriate caseload size- based on work load, not caseload. I have been in positions where I was over scheduled and didn’t have the time to provide adequate therapy to students, but the district was unwilling to help in any way. I do not believe in organizations, such as unions, to determine such standards. I am willing to be part of that national organization. Please take the time to fill out the current survey.